Last night I began to use Crinone progesterone gel containing natural progesterone, which is an essential hormone for preparing the uterus for pregnancy and on-going support of pregnancy. Doing as I was told, I diligently gave myself the first dose last night before bed. It wasn't until this afternoon when I am battling to keep my eyes open, let alone get off the couch, that I decided to look up what the side effects of this latest drug can do. I've heard that it gives symptoms similar to pregnancy, and because I haven't had my transfer yet, I am very aware that I am the opposite of pregnant right now. Woah! Is it just me, or have they just listed everything they can think of? If you don't have constipation, perhaps you'll be lucky enough to have diarrhoea or vomiting! This stuff is pretty full-on. I managed to avoid any weird symptoms during the injection phase of the cycle, but I feel that I may not escape so easily from this hormone. My breasts have been untouchably sore for the last 2 days. The pain wakes me up several times during the night, similar to when I was pregnant last year. Perhaps this has something to do with that hCG injection before retrieval. I don't really know. But I guess that from now on, I can blame this progesterone gel.... for everything! So I've been thinking of our little embryos today and wondering how they're going. I hope they know I'm doing everything possible to make a nice, cosy home for one of them for the next 9 months. I hope they're being rockstars and growing. They should be at 2 to 4 cells by now, and on their way to being 6 to 10 cells tomorrow (Day 3). I don't know if it's a good or a bad thing that it's the weekend and I have to wait until Monday for an update on the embryo progress. Monday will be Day 4 - and soooooo much can happen between now and then! I've got a feeling that at least one of them is showing off and getting really ridiculously good-looking, you know, just to make sure it gets noticed enough to be chosen for transfer. Well, here's hoping! The sore breasts are most likely the HCG trigger shot and the super high Estrogen you probaly had with so many follicles. I did not have any exceptional tiredness with Crinone, but yes it is a common side effect of Progesterone. The one thing I do want to mention - nobody told me and I learned the hard way - is that crinone tends to leave a deposit inside. Every couple of days you need to clean it out. I did not know, so after using it for 14 days and after my BFN I had horrible watery discharge and I thought I had a yeast infection but it was my body trying to get rid of al that that gunk. You may also see "chunks" fall out occassionally. Sorry TMI but since you have never used it I wanted to give you a heads up. Good luck on the fert report. That crinone is just nasty pure and simple. All of the stuff it leaks out and the balls of wax that you have to dig out. I also hated that its not detectable in a blood test since it goes straight to the area where its needed. Hope little embies are growing away. It is almost time to for transfer! 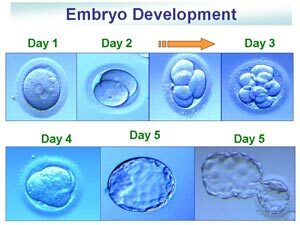 I love the graphic about embryo development. I haven't seen that before and will now be stealing it!! All the luck to you from Alabama! !